Half term week is always a busy one – Hobbledown and Denbies keep Barry busy. Wednesday saw us at Denbies, yet again enjoying the natural landscape to show the falcons at their best. We were excited to have Luke Whatley-Biggs come along to take some video and photos of the birds, take a look at the ‘Live Entertainment’ page to see what he came up with for us. Luke was also the young man responsible for the wonderful footage from the Surrey Hills Wood Fair as detailed above. Fri/Sat/Sun of half term Barry will be at Hobbledown Children’s Farm, Epsom – the weather is promising to be be kind and dry and he’s looking forward to entertaining some Halloween excited children! 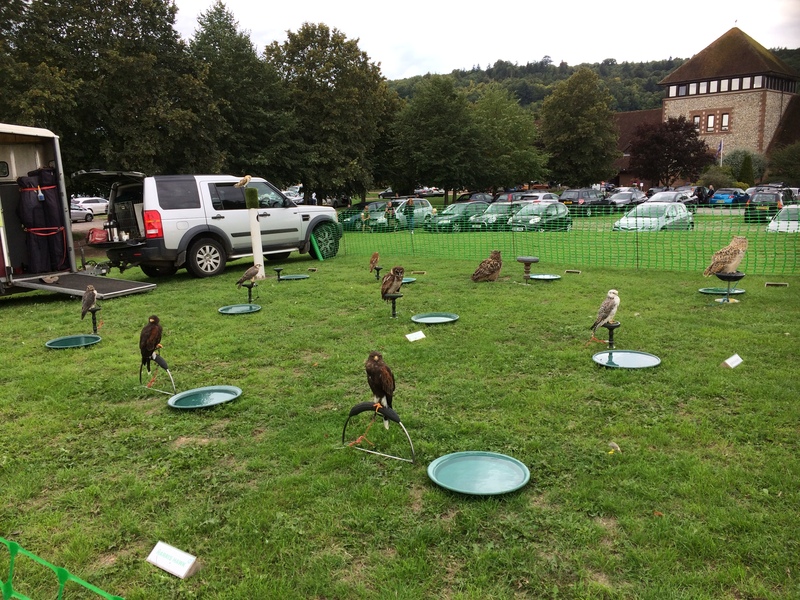 We have been invited to display the birds at an exciting event new to us on 6th/7th October, The Surrey Hills Wood Fair 2018 https://www.surreyhills.org/events/the-surrey-hills-wood-fair-2018/ (Please check out their website for entry prices). We went for a site visit last week and the venue is simply stunning and perfect for flying the falcons. Flying display times are 12.45pm & 2.45pm on Saturday and Sunday, and the birds will be on static display 10am-5pm both days. All the birds are in fine fettle, Ned, the new recruit did manage to do a quick tour of Ewell and Sutton the other week having been carried by the wind from Hobbledown. After an evening of following his transmitter signal we located him roosting in a tree next to Sutton train station. Barry lured him to safety in the early morning light much to the amusement of commuters on the Kingston road! We will also be at Denbies on Wednesday 24th October and hope to see some familiar faces, always one of our favourite venues. We had an absolute blast at Denbies Vineyard yesterday, if you were there and are reading this – thank you all for being such an appreciative audience. Biggest thanks have to go to young Lily and Lola who saw us at Hobbledown and made a special trip to see us again at Denbies. Not the sharpest of photos, but a vision of contentment of 10 birds all looking forward to their day. Barry always feels like he’s giving his birds ‘a day at the beach’ when we visit Denbies. The regular pitch we use is always well mowed and litter free, there are trees for the Harris Hawks to fly to and from, and the surrounding landscape is just perfect for the falcons to do their turns and stoops. The displays are usually scheduled for a hawk, an owl and a falcon to strut their stuff – but we can never resist the temptation to fly a few more as a treat for the birds (and hopefully those of you who linger a little longer). So yesterday we also flew Charlie – Harris hawk, Kai our gyr/lanner and Ned (a brother of Kai but from this year’s hatch), the newest recruit who has only just been let loose and is doing fabulously. The two youngest owls, Bonnie the Tawny and Pip the Barn Owl had an outing too. Due to the hot weather over the summer, they haven’t been able to be out with us as much as we would have expected. Jane has been working with them at home everyday and they are progressing really well, now being flown (on a long line) to the glove and it won’t be long before they are flying free. Now that the summer holidays are drawing to a close, we shall be at Hobbledown every weekend but not weekdays. Please check our website and Hobbledown’s to avoid any disappointment. Our next Denbies date is Wednesday 24th October. Don’t forget this is a ‘Free’ attraction – you can park up and come and see us. Denbies kindly have us there for your enjoyment, at no charge! If you’ve ever been to visit us and enjoyed the display and chatting to Barry, Willow and Jane about the birds, do please give some feedback to Denbies (and us!). We have a few Autumn fixtures to add to the diary next week, bookmark our website and we’ll try to keep you up to date. Hope you’ve all enjoyed the summer holidays – for us it has ‘flown past’ and the autumn nights are well and truly drawing in. We are out and about at various venues until the end of October – so keep an eagle eye on us! Well the weather has given us a bit of respite and we’ve been busy at Hobbledown and we’ll be there Mon-fri for next week too. Might have to get the mower out as the grass seems to be growing again! 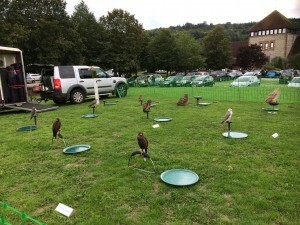 Don’t forget we’ll be at Denbies on Wednesday 29th August with all the birds. Ned the new gyr/saker is doing oh so well with his training and his older brother was stunning at Hobbledown today, they’re both exciting additions to the team. 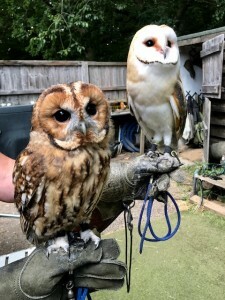 Bonnie and Pip the owls are doing well but training has taken a back seat due to the hot weather – they’ve been out and about with Barry and Willow a bit but also at home when the temperature has soared – but they’re both in top notch form and looking beautiful. We have some new exciting dates for the Autumn so watch this space for news of where we shall be. A look back on July…..
At the risk of repeating myself, but the warm (very hot!) spell has continued, and continued and continued. It’s been a very hard few weeks for not only for our birds, but for the wildlife too. Ponds have dried up, blackberries are drying out before even coming ripe and the apples on the trees are still the size of acorns rather than swelling. Take a minute to think of what you can do to help the wildlife – a dish of water with a crust or two soaked in it might just make the world of difference. We’ve had some lovely days out with extremely considerate hosts – namely Chipstead Flower Shower and Ewshot Village Day who both provided us with pitches in the shade of trees – what a difference that makes for the birds. 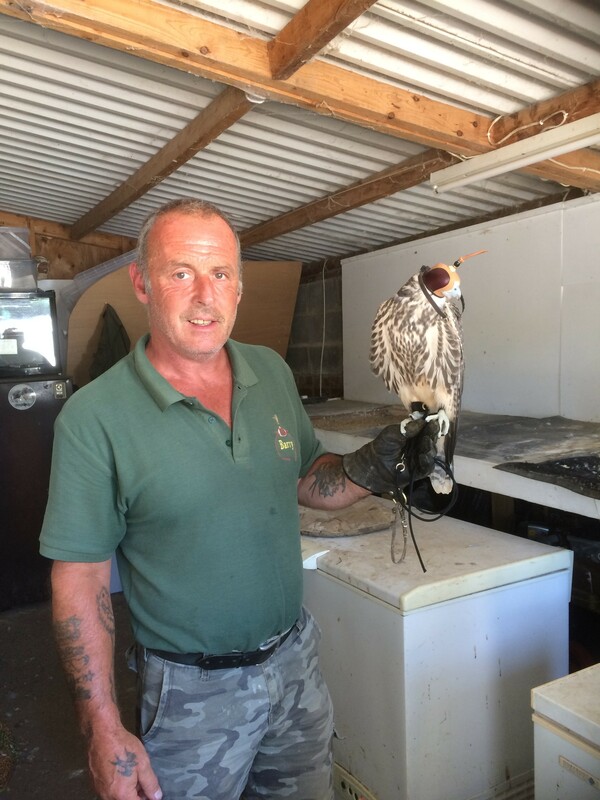 Ned the gyr/lanner falcon, the new recruit, is coming on oh so well, just like his brother (Kai) last year. He’s a peach and hasn’t really put a foot wrong and he and Barry have a forward going great relationship already. The heat has meant that the Pip and Bonnie (the owl chicks) have stayed at base most of the time with Jane doing the daily lunch time feeding and handling in the shade. Sophie, our willing volunteer has been coming in and helping out and getting her ‘hands on’ experience which is such a benefit to the birds and to us. 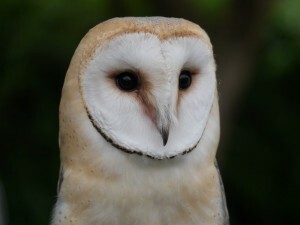 Barry is now fully occupied at Hobbledown for the weekdays during the summer holidays, although please check ours and their website if you are planning on seeing us – if temperatures soar again we have taken the view that with welfare in mind, we won’t travel the birds to outside venues in extreme heat, so please ring Jane (07850 081686) to check if we will be there on any given day. We are so looking forward to our visit to Denbies (Wine Estate, Dorking) on 29th August. The venue is superb for Barry to fly the Falcons as well as the Harris Hawks and as it is a free display, anyone can come along and see the birds, located adjacent to the car park, at no charge, (entry beyond to the vineyard may incur fee). We have so many regular visitors that keep coming back to see us time and time again – we know your faces, we know some of your names, and we love seeing you. To us it means we’re doing what we set out to do – to proudly display the birds we are so passionate about and that we care for, and to talk about them to anyone who cares to listen or ask questions! 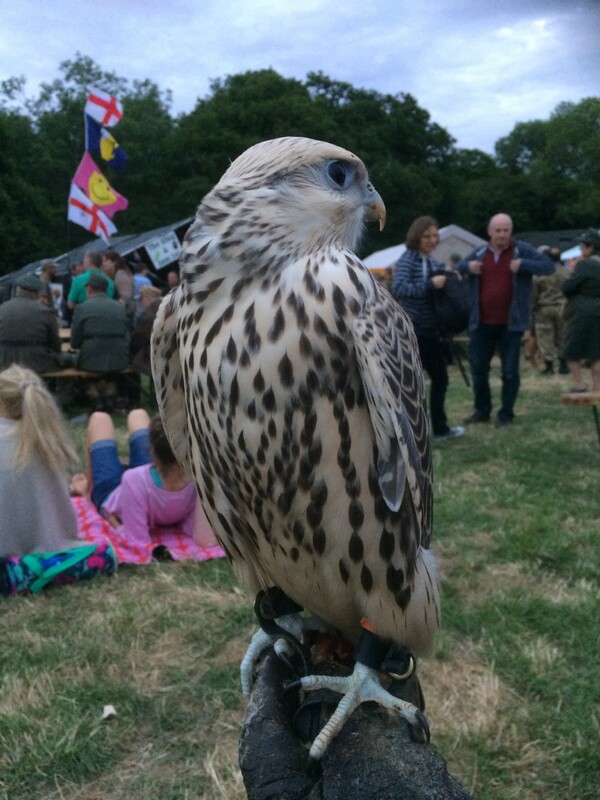 To Linda who came to us for a birthday treat of a hawk experience at the beginning of July, how lovely to see you and Graham at Chipstead flower Show, make sure you can make it to Denbies next time. We’ll give you a glove and you can get a bit more hands on again! The warm spell continues….! Barry has been to collect our last addition to the team for the year, a gyr/lanner youngster, brother to last years new recruit, Kai. First evening at home with us and the dog, watching the England World Cup game and he seems to feel at home already – unhooded, eating a couple of chicks off the glove and unfazed by it all, a brilliant start to the working relationship Barry and he will build together. Don’t know about you, although it’s still beautifully warm, the breeze today was more than welcome. 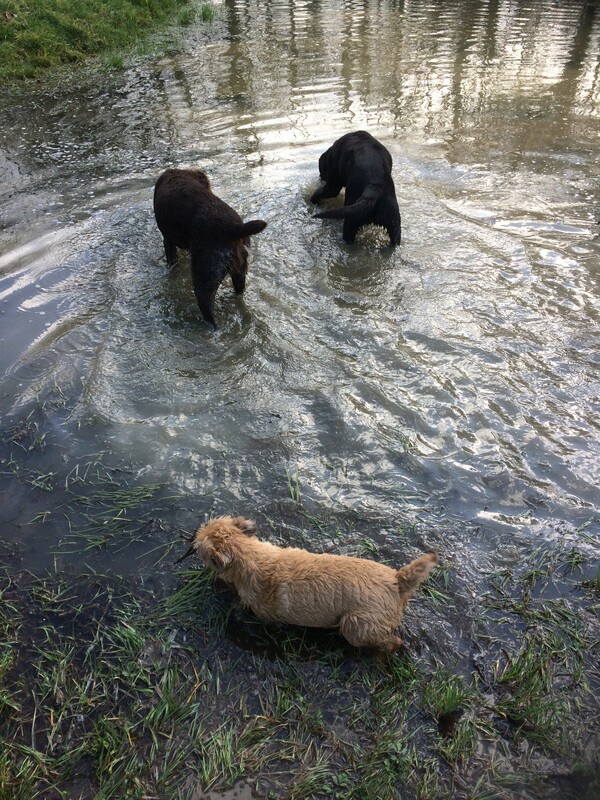 We had a lovely walk with the dogs this evening – always a highlight at the end of every day when they charge into the stream for a cool down on the way home, and why does the smallest dog always find the biggest stick to retrieve and try to carry it home??!! A very hot one on Saturday at Hobbledown, and a reprieve from the heat today, with a few clouds and a lovely breeze at Gatton Country Fair. The buzzards must be watching this website as they always seem to know exactly where we are! The result? Kai and Ted the falcons both taking refuge in trees for a while until danger had passed which made it hard work for Barry to show them doing what they do best. Crisis was averted and they were lured to good landings on a lower piece of ground. Dellboy and Charlie the harris hawks showed themselves off a treat. We were very happy to welcome a new volunteer to the team today, Sophie! Sophie has had a long term interest in birds of prey, has taken herself off to complete a 5 day falconry course in Kent and got in touch with Barry about getting some hands on experience locally. She came to see us at home during the week, went shopping and got herself the compulsory green shirt, a new glove, and came along to join us for today – and the girl ‘did good’! Welcome Sophie! Hope we’ll be seeing a lot more of you. Willow on the right, Sophie in the middle, and no prizes for guessing who’s on the left. Last little note – weekend of 7th/8th July Barry, Jane and Willow are downing tools for the weekend to support a fantastic family/friends organised local event ‘The Capel Military Show’. https://www.capel-military-vehicle-show.com/ – a fantastic non-stop weekend, great Saturday evening entertainment and camping available – please see their website for details and bookings. The weather looks guaranteed so why not get out there and enjoy? Well we’re certainly cooking on gas this week – hot, hot, hot. 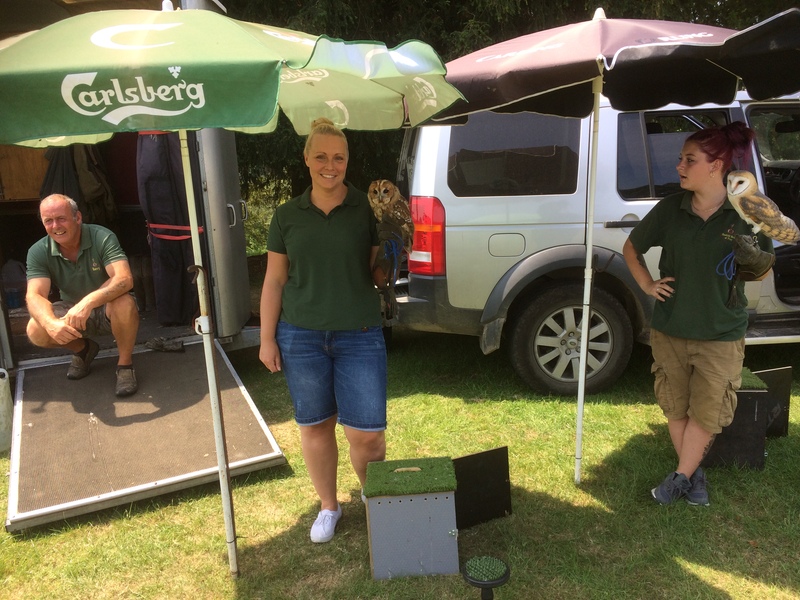 We had a lovely afternoon at Capel Vicarge Fete on Saturday 23rd, just taking two Eagle Owls for the fete goers to see and had such a great afternoon, relaxing and talking to some lovely people. It’s the first time Barry has managed to free up a day to go along to support the local event and he’s already thinking about doing just a ‘little bit more’ for the Fete next year – a few more birds? Perhaps even a few words with a Harris Hawk showing his stuff? It could be that the quality of the burger from the BBQ has swayed it! I don’t know who was responsible for the buying/cooking of said burgers – but they were truly delicious – thank you! And thank you to John Dale Snr for inviting us along. The good news is that the grass isn’t growing so no mowing for me this weekend (phew!) – the other news is that Barry has a new job description ‘Parasol Monitor!’ Each and every bird has it’s own piece of shade when the sun is as relentless as it has been this week, but as the sun comes round, the shade moves – that means Barry has to move too – to shift the umbrellas. The birds are all enjoying a bit of R&R and a paddle in their baths for a couple of days and appetites are small in the heat. We shall be at Hobbledown Children’s Farm, Epsom on Saturday 30th June and Gatton Country Fair (Reigate) on Sunday 1st July, check out our offsite page for details of entry etc. Last little note – weekend of 7th/8th July Barry is downing tools for the weekend to support another fantastic family local event ‘The Capel Military Show’. https://www.capel-military-vehicle-show.com/ Last year he had just collected ‘Kai’, his Gyr/Lanner Falcon and as part of the socialising process we took him to this wonderful show and although Kai was young, he totally took everything in his stride. We are due to collect another young falcon early next week and this next little chap will no doubt be accompanying us for the weekend wherever we go. (It does count out a spin on the dance floor though with a bird on the glove!). Check out the Military Show website, it is a fantastic weekend, Saturday evening entertainment, food and bar were just fab last year. Pack up your kids, a picnic, collect the Granny’s and Grandpa’s and come along. The tanks crushing cars, the cannons and guns going off and the re-enactments are brilliant. Not to mention the helicopter rides, fantastic food stalls and every military vehicle you could ever wish to see. And for the ladies, there is even a bit of shopping to be had. Bookham Community Association organised a fantastic Village Day which we thoroughly enjoyed. There were a few ‘hold your breath’ moments when Kai the falcon was mobbed by a couple of indignant local crows which spooked him a little, but bless him, he flew back to Barry and the lure and landed safely and all was well. Terry Buckman has generously let us use some of the beautiful photos he took on our website, thank you Terry! The birds will be on static display throughout the day, come along and see them and chat to find out more about these beautiful birds. Barry will be doing two commentated flying displays in the main arena, check out http://www.bookhamcommunityassociation.org for more details of a host of attractions and events going on throughout the day. Now on to this week – we will be busy on Tuesday 22nd visiting Bentley Copse, Cranleigh to educate/entertain 100 Yr 6 pupils with the birds and are praying that we don’t have the rain/thunder that keeps flashing up on the weather forecast. Saturday and Sunday see Barry and his daughter Willow with the birds at Hobbledown, Epsom, and Bank Holiday Monday we shall be at Cheam. Pip and Bonnie the Owlets are doing famously well, eating us out of house and home, not to mention covering every surface with fluff and down that they’re discarding to make way for their beautiful adult plummage. They’re such great entertainment with their quirky habits and learning about all sorts of new sounds and sights. Bonnie the Tawny is now ‘grown up’ enough to have some lovely playtime during the day in the aviary where there’s a wonderful selection of perches and shelves for him/her to fly to and from, getting some exercise and developing whilst enjoying the view. We still haven’t determined if Bonnie is a he or a she, time will tell! Bonnie may have to become a ‘Bonnie Prince Charlie, or just a Bonnie wee Boy! But since he/she’s learnt his/her name, we can’t really change it now. She/he is happily sitting on the glove for food, is very gentle with beak and feet and will nibble at hair or earlobe if allowed. Pip the Barn Owl is catching on quickly and almost ready to start branching out and the plummage is looking like she’s probably a girl. Won’t be long before she is in the aviary too enjoying an idyllic ‘childhood’ of attention, love, food, and with a bit of freedom to spread her wings. We’re hoping Connie, a Henfold Birds of Prey volunteer who’s been on maternity leave, will be joining us for a visit tomorrow evening along with her new camera – we’re relying on her to take some smashing shots that we can post up on here later in the week. No pressure Connie!! The Cowpie was such a fantastic event, so well organised, well done to the YFC and their team of organisers. The weather on Saturday was against them but they pulled it off and Sunday was just the ticket! The weather was kind, the birds flew so well, and we thoroughly enjoyed ourselves, hope you all did too. It was lovely to talk to so many people who were interested in the birds and what we do. Its always a privilege to talk about something you love passionately to people who are genuinely interested and help them gain an insight into the fascinating world of falconry. We never tire of talking ‘birds’, so please, if in doubt, just ask! Well, we’ve been to set up on Saturday afternoon and the showground is looking good. We know it’s been raining pretty much all day but the ground underfoot is still, in racing speak,’good to firm’, so we are looking forward to a great day. 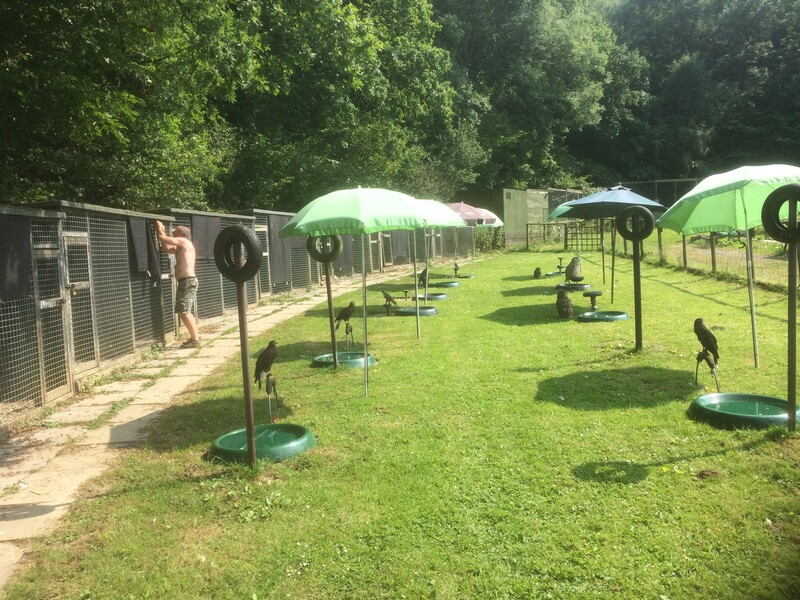 Just in case the sun makes a strong appearance, we’ve put up plenty of shade for the birds which also acts as an umbrella in case it rains so we can keep the birds dry for their flying displays. A wet bird just won’t want to fly! So fingers crossed, the weather will be kind and we can show these beautiful birds doing what they do best. 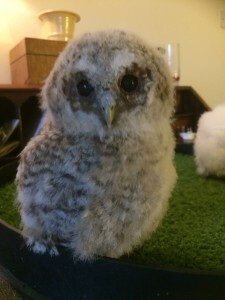 Bonnie the Tawny Owl chick has discovered her wings and at 6 weeks old is rapidly growing older and wiser. 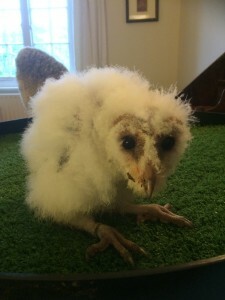 Pip the Barn Owl is a slower maturing species (and still pretty ugly!) but will be joining in and getting used to the sights and sounds of a day with us at the show. Wow! What a scorcher – hope you are all enjoying a blazing Bank Holiday Weekend. Well, today was a bit of a hot one – lots of parasols required to give the birds some shade. We seem to have gone from Wintery/wet weather last week to a full on Summer this weekend, tricky for the birds, trying to keep their weights right for flying. Delboy the Harris Hawk strutted his stuff, then Ted the Peregrine/Saker proved a point by not being hungry enough to focus on the lure, but enjoying the lovely warm thermals enough for an ‘Up, up and away’ into the distance! As per normal, he was wearing a GPS tracking device and after Barry with iPad in hand, encountering a stream, a few brambly ditches and a couple of barbed wire fences (scars to prove it! ), he located Ted, enticed him back to the lure, and all came home safely. Lady and Kai, our other falcons, flew beautifully later in the afternoon despite the heat. Bonnie and Pip, the new recruit owl chicks were a big hit with the show goers and we never tire of explaining that they may look like ‘ugly ducklings’ this week, but give it a fortnight and they will be more like swans! Tomorrow is another day and the weather looks set to be even hotter. We will be there all day and flying display is approximately 2.15-3.15pm. Please drop by and see us if you are visiting the SESHA show.